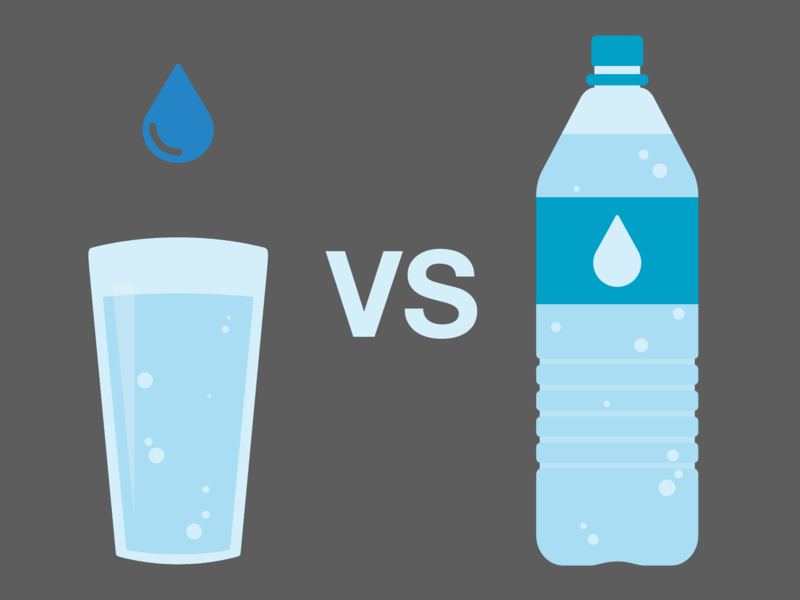 There is a constant debate on which is better: bottled water vs tap water. What is the best type of water to drink? Is kind healthier than the other? Are there any dangers? While there are pros and cons to both, let’s take a closer look at what may make one type of water more desirable to drink than the other. Although there are some concerns in certain areas of the US, such as Flint, MI, on the effectiveness of public water filtration, almost all of the US has great public water filtration. This blog from Advanced Water Solutions goes into more detail on public water treatment, and whether or not it's trustworthy. Overall, the water coming from your tap is safe, healthy, and well-filtered. Your public water treatment plant uses a several-step process outlined here that works well most of the time. Besides catastrophic failures such as in Flint, the only real concerns with publicly filtered water is slightly elevated minerals that can cause a mild odor or taste. It could also be too hard or too soft. These issues are easily solved with an in-home water filtration system. Most bottled water companies use methods of purifying water by using extreme filtration to treat the water before they bottle it. In general, this process does not make the water any healthier, and it is not a better process than the one your public water company uses. In fact, this process of extreme filtration can actually make the water acidic. So what is extreme filtration? This process includes up to 5 steps, including reverse osmosis, distillation, deionization, and more. Using too many filtration steps in this kind of combination can make "dead water." Dead water has no healthy minerals left in it, making it similar to acidic rain. Over-filtered water is called “dead water” because of the death of cells, tissues, and life due to this type of water. In nature, as this acidic water soaks into the ground, it will pull the healthy minerals from the rocks and soil over time. Then the bottled water companies come in and extreme filter all of these minerals back out before they bottle it for you. Sure, it still gives your body hydration, but you are not getting any of the health benefits of water by drinking the over-filtered water from that plastic bottle. In fact, drinking too much completely pure water is detrimental to your health. Most bottled water is void of healthy minerals, has no electrolytes, and is slightly acidic. This creates a problem when you drink a lot of it, because this water attracts minerals and will dissolve more minerals from its surroundings as soon as it can. Meaning it will absorb acidic minerals from the air and alkaline minerals from your bones, joints, and muscles in order to fill that void created by the extreme filtration. If you tend to consume a lot of this bottled water, it will rob your body of the healthy and essential minerals over time. This is not a good thing. Tap water is purified with the filtration steps just enough to make it clean and consumable, while keeping the minerals your body needs in the water. What do your teeth have to do with the water you drink? You may think that you can only get cavities from consuming too much sugar or not cleaning your teeth enough, but there are other things that can wreak havoc on your teeth. The biggest concern is acidity. We know that dental erosion as well as tooth decay can happen when a person over consumes acidic foods and beverages. As you drink that overly filtered bottled water, you are probably not thinking about how you may be hurting your teeth. With so much acid in the bottled water due to the over filtration, you are adding to your overall consumption of acidic beverages without even knowing it. Simply drinking tap water instead will help your overall tooth health and prevent tooth decay and erosion. Tap water also has small amounts of fluoride added to help strengthen teeth. It is unknown how much or how little fluoride is contained within any particular brand of bottled water. All bottled water may seem the same, but unfortunately they are not controlled very well. It’s impossible to tell whether the liquid has been over-filtered, under-filtered, or filtered just the right amount. It’s been found that some bottled water companies simply fill their bottles with public tap water anyways, even if they claim that it comes from natural springs. Another concern is plastic. Our overuse of plastic is terrible for the environment and is really stacking up in the landfills. Not only that, but tiny amounts of plastic end up in the water you drink from plastic bottles. On the other hand, you can always get your public water source tested and know exactly what is flowing into your home. If you don’t like the levels of any of the substances, you can always improve it with home filtration! Filtered Water Pitchers - The cheapest option is to simply buy a pitcher that has a water filter in it and fill it with water from your tap. Keep it in your fridge and fill your water bottle or glass as needed. This only works with small quantities of water, and is best used if you only need small amounts of filtered water. Faucet Filter - You can attach a water filter to your kitchen faucet. Anytime you run the faucet, you will have the purified water flowing right into your pan or glass. Whole-House Water Purification - If you want the water coming from every tap to taste better or not be as hard, you can always go for installing a full home filtration system. It will pay off in the long run, as it makes cleaning easier. Also, you will know that the water you drink from your tap has a great taste and all the health benefits. With so many options available to make your tap water even cleaner to drink (without over-filtering it), it’s safe to say that taking out that reusable water bottle and filling it up is a better way to drink your water than single-use bottles of water. You need those minerals in the water more than you need the ease of that pre-bottled water that has been sitting on the shelf for who knows how long and contains unknown amounts of healthy minerals and unhealthy plastic.